Average costs for wind and solar energy can undercut existing coal generation even without subsidies, according to analysis from the research firm Lazard. Factoring in federal subsidies for wind and solar, the renewable resources become even more competitive against coal and challenge nuclear and gas plants. The findings come on the heels of multiple utility announcements that they will replace coal and nuclear plants with renewable energy and natural gas. Lazard's latest numbers illustrate how renewable energy's ability to challenge existing coal generation on cost is spreading across the U.S. The trend began in the windy plains and upper Midwest, where Xcel Energy's utilities have announced plans to retire about half of their coal-fired capacity in the coming years and replace it largely with wind energy. "We're looking at [wind energy prices] in the low teens to low 20s [in dollars/MWh] — not starting prices, but levelized across the 25-year life of the project," Xcel CEO Ben Fowke told Utility Dive last year. "That beats gas, even at today's prices." Recently, that competitiveness has spread to other regions. Last month, the Northern Indiana Public Service Co. (NIPSCO) released analysis showing that it could save ratepayers $4 billion over 30 years by retiring two coal generators early and replacing them with nearly all wind and solar energy. The Lazard numbers reflect those changing economics. At the low end of price estimates, wind energy beats out existing coal and nuclear plants, while utility-scale solar hits price parity with coal. The application of federal subsidies makes the resources even more competitive. The $0.023/kWh federal subsidy enjoyed by wind energy for much of the decade is being drawn down ahead of its expiration in 2020, but its application makes it even more competitive with fossil fuels and nuclear. 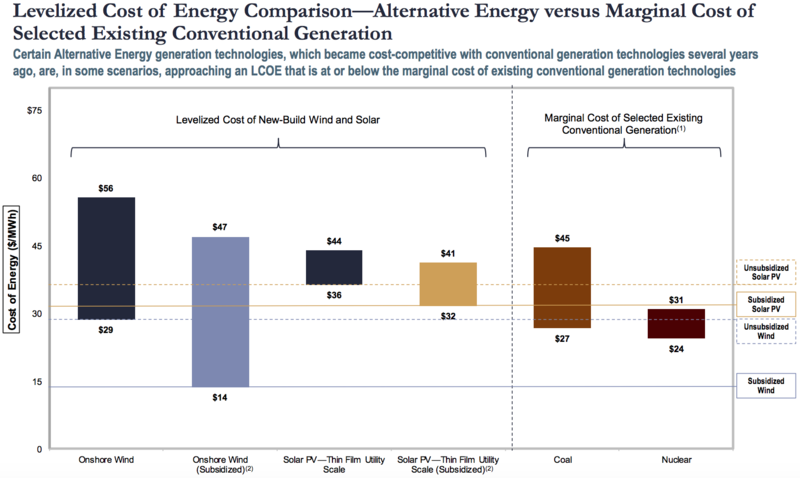 While wind and solar have gotten steadily cheaper over the last decade, they do not generate power at all times. To balance out the system, many utilities are shifting away from coal to natural gas generation, and in 2018 will add more gas-fired capacity to the grid than any other resource. 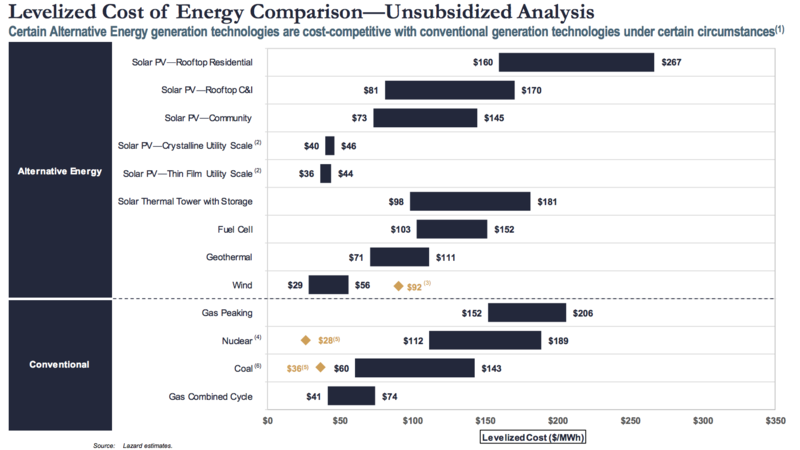 Lazard's latest numbers reflect the relative affordability of natural gas generation, but also show that wind and solar can compete with it on price. In some jurisdictions, utilities and their regulators are beginning to look at energy storage to stabilize the grid as a non-emitting alternative to natural gas. 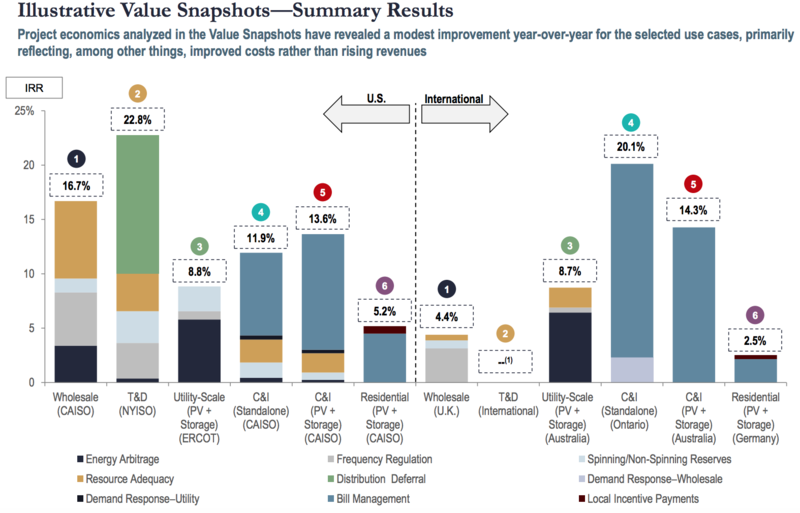 Last week, California regulators approved utility PG&E's plan to replace three natural gas plants with energy storage, a decision made possible by steady price declines in batteries illustrated in a separate Lazard report. Market opportunities for storage today are greatest for shorter-duration applications, Lazard said, like deferring grid infrastructure upgrades or providing behind-the-meter services to reduce customer bills. 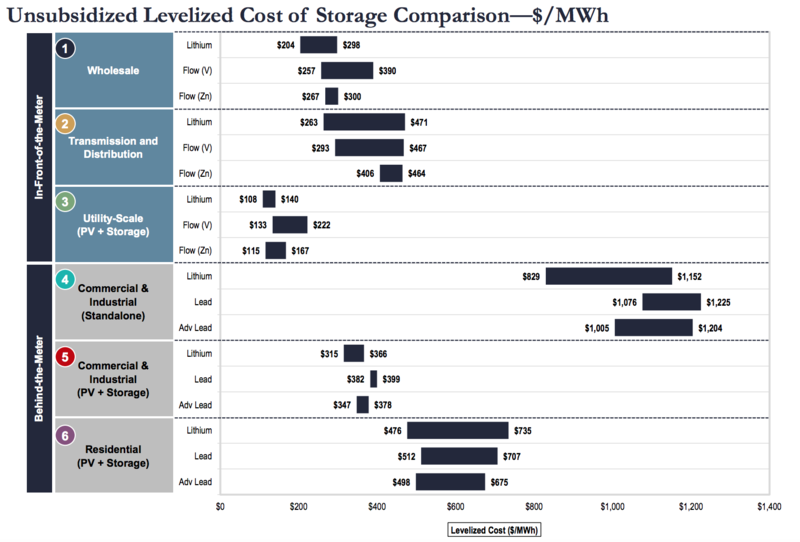 Cost trends for storage could be slowed by material shortages in the future, Lazard warned. "Future declines in the cost of lithium-ion technologies are expected to be mitigated by rising cobalt and lithium carbonate prices as well as delayed battery availability due to high levels of factory utilization," the firm wrote.